Almost two third of electricity requirement of the world is fulfilled by thermal power plants (or thermal power stations). In these power stations, steam is produced by burning some fossil fuel (e.g. coal) and then used to run a steam turbine. Thus, a thermal power station may sometimes called as a Steam Power Station. After the steam passes through the steam turbine, it is condensed in a condenser and again fed back into the boiler to become steam. This is known as ranking cycle. 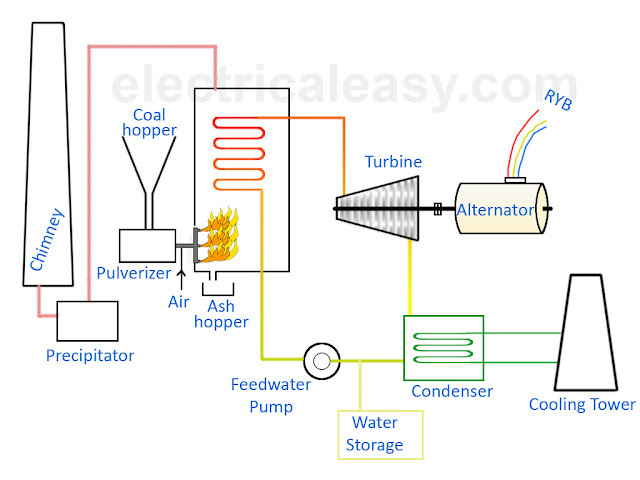 This article explains how electricity is generated in thermal power plants. As majority of thermal power plants use coal as their primary fuel, this article is focused on a coal fired thermal power plant. A simplified layout of a thermal power station is shown below. Coal: In a coal based thermal power plant, coal is transported from coal mines to the generating station. Generally, bituminous coal or brown coal is used as fuel. The coal is stored in either 'dead storage' or in 'live storage'. Dead storage is generally 40 days backup coal storage which is used when coal supply is unavailable. Live storage is a raw coal bunker in boiler house. The coal is cleaned in a magnetic cleaner to filter out if any iron particles are present which may cause wear and tear in the equipment. The coal from live storage is first crushed in small particles and then taken into pulverizer to make it in powdered form. Fine powdered coal undergoes complete combustion, and thus pulverized coal improves efficiency of the boiler. The ash produced after the combustion of coal is taken out of the boiler furnace and then properly disposed. Periodic removal of ash from the boiler furnace is necessary for the proper combustion. Boiler: The mixture of pulverized coal and air (usually preheated air) is taken into boiler and then burnt in the combustion zone. On ignition of fuel a large fireball is formed at the center of the boiler and large amount of heat energy is radiated from it. The heat energy is utilized to convert the water into steam at high temperature and pressure. Steel tubes run along the boiler walls in which water is converted in steam. The flue gases from the boiler make their way through superheater, economizer, air preheater and finally get exhausted to the atmosphere from the chimney. Superheater: The superheater tubes are hanged at the hottest part of the boiler. The saturated steam produced in the boiler tubes is superheated to about 540 °C in the superheater. The superheated high pressure steam is then fed to the steam turbine. Economizer: An economizer is essentially a feed water heater which heats the water before supplying to the boiler. Air pre-heater: The primary air fan takes air from the atmosphere and it is then warmed in the air pre-heater. Pre-heated air is injected with coal in the boiler. The advantage of pre-heating the air is that it improves the coal combustion. Steam turbine: High pressure super heated steam is fed to the steam turbine which causes turbine blades to rotate. Energy in the steam is converted into mechanical energy in the steam turbine which acts as the prime mover. The pressure and temperature of the steam falls to a lower value and it expands in volume as it passes through the turbine. The expanded low pressure steam is exhausted in the condenser. Condenser: The exhausted steam is condensed in the condenser by means of cold water circulation. Here, the steam loses it's pressure as well as temperature and it is converted back into water. Condensing is essential because, compressing a fluid which is in gaseous state requires a huge amount of energy with respect to the energy required in compressing liquid. Thus, condensing increases efficiency of the cycle. Alternator: The steam turbine is coupled to an alternator. When the turbine rotates the alternator, electrical energy is generated. This generated electrical voltage is then stepped up with the help of a transformer and then transmitted where it is to be utilized. Feed water pump: The condensed water is again fed to the boiler by a feed water pump. Some water may be lost during the cycle, which is suitably supplied from an external water source. It requires less land as compared to hydro power plant. The fuel (i.e. coal) is cheaper. The cost of generation is lesser than that of diesel power plants. It pollutes the atmosphere due to the production of large amount of smoke. This is one of the causes of global warming. The overall efficiency of a thermal power station is low (less than 30%). A huge amount of heat is lost in various stages of the plant. Major part of heat is lost in the condenser. That is why the efficiency of thermal plants is quite low. Thermal Efficiency: The ratio of 'heat equivalent of mechanical energy transmitted to the turbine shaft' to the 'heat of coal combustion' is called as thermal efficiency. Thermal efficiency of modern thermal power stations is about 30%. It means, if 100 calories of heat are produced by coal combustion, the mechanical energy equivalent of 30 calories will be available at the turbine shaft. Overall Efficiency: The ratio of 'heat equivalent of electrical output' to the 'heat of coal combustion' is called as overall efficiency. The overall efficiency of a thermal plant is about 29% (slightly less than the thermal efficiency).